The benefits of running Windows CE 5.0 on a XPAC device include hard real-time capability, achievable deterministic control and allowing PAC can have a PC-like window displays and operating environment. 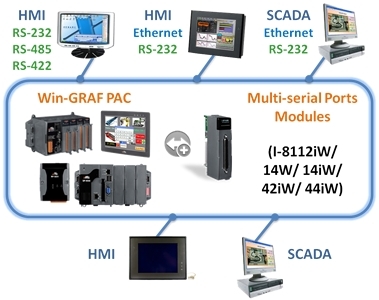 The PACs are capable of running Win-GRAF (IEC 61131-3 Standard) software to develop logic control applications, and also supporting M.S. VS 2008 software (VB .NET, C#) to develop HMI and data management applications that can exchange data with Win-GRAF applications. So the application's design is more convenient and more practical. Win-GRAF is a powerful, PLC-like, softlogic development software. It is installed on PC with windows 7 or 8. It supports the international PLC language standard - IEC 61131-3 - Ladder Diagram (LD), Function Block Diagram (FBD), Sequential Function Chart (SFC), Structured Text (ST), Instruction Set (IL), suitable to develop applications for the full range of Win-GRAF PACs from ICP DAS. Only the WG-Communication Server (behavior like a Cloud Server) needs a public IP (support Domain Name). Other PACs and PCs that connect to this Server no need a public IP. The user can monitor the remote PAC by using a 3G wireless network or an intranet. update the Win-GRAF PAC Driver. The PAC can actively send a Log File to a PC (WG-Communication-Server). programs, and can exchange variables with the Win-GRAF control programs. Can Control more than 200 PID in one PAC. Support Soft-GRAF HMI : WP-8xx8, WP-5xx8-CE7, XP-8xx8-CE6, WP-9xx8-CE7 and VP-x2x8-CE7 PAC. Modbus RTU/ASCII Master A max. of 32 ports: COM1 ~ 33 (*) to connect other Modbus Slave devices(Like M-7000). Modbus RTU Slave A max. of 16 ports: COM1 ~ 33 (*) for connecting SCADA/HMI/OPC Server. User-defined Protocol Custom protocols can be applied at COM1~ 33 (*) by using Serial communication functions or function blocks. DCON Remote I/O A max. of 16 RS-485 ports: COM1 ~ 33 (*). Each port can connect max. 50 nos I-7000 series modules or 50 nos I-87xxxW I/O modules in expansion units (I-87K4, I-87K8, I-87K9, RU-87P8, RU-87P4). Recommend connecting no more than 32 modules in each port for better scan rate. Redundancy 2 XP-8xx8-CE6 can set a redundant system, when one is damaged or crashes, the other can still take up and continue the work. The system offers 3-line communication redundancy, LAN1, LAN2 and Alive Port (COM5), as long as one of the three communication lines still connects normally, this redundant system can normally control the process. The redundant system provides a public IP address that allows SCADA/ HMI software to access it without needing to determine which one is the Active IP. Schedule Control Supports the "Schedule-Control Utility" (free) to implement schedule control. Each PAC can control max. 10 Targets (devices) with different schedule settings in each day / holiday / special day / season / year. File Access and Data Log The Win-GRAF supports file operation functions to read/write files in the PAC's micro_SD or flash memory to do data log or file access. Soft-GRAF HMI Support to run HMI program (developed by the Soft-GRAF Studio) together with the Win-GRAF logic-control program in the same PAC. if they are installed in slot 1 ~ 7 of XP-8xx8-CE6. * Only XP-8048-CE6 has COM1. XPCE6-GUP-18000 Upgrade XP-8x41-CE6 to XP-8x48-CE6 to support Win-GRAF. Win-GRAF Workbench Win-GRAF Workbench Software (Large I/O Tags) with one USB Dongle.